Absolutely gorgeous! 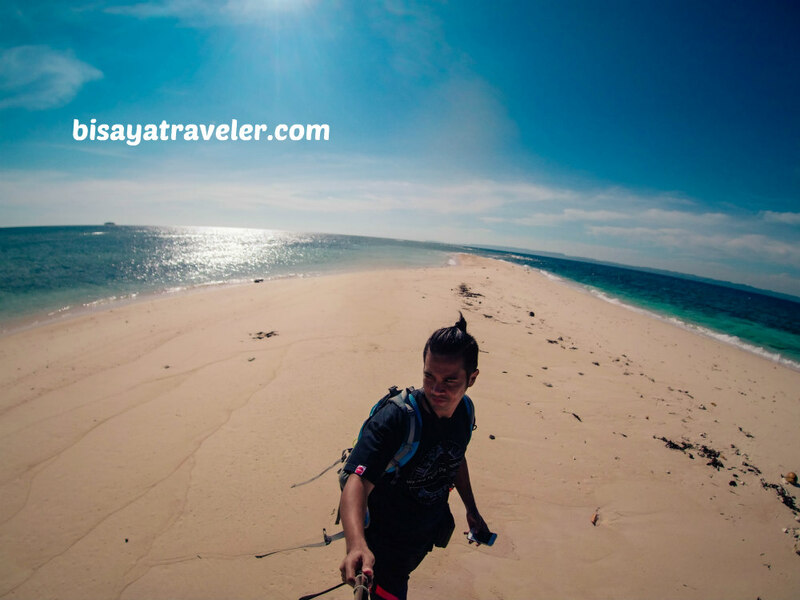 Those were the words my inner monologue said, as we were soaking up the tropical vibes on Hagonoy Island, Britania Islands. I was tempted, intrigued and enthralled. With its sparkling azure waters and fine white sands, there was no way I was going to pass up on the opportunity to swim on Britania Islands. Like an enchanter, the picture-perfect sea was calling us, luring us with its sheer majesty. For a while, I felt like I was under its spell, mesmerized by its irresistible tropical grandeur. I had to take a plunge! After all, no island hopping adventure is complete without a little swimming escapade. And, just when I was about to submerge into its spotlessly clean waters, my inner voice broke the spell. Then, I realized that swimming on Britania Islands that day wasn’t quite a bright idea. There was something holding us from dipping into its waters. And, that was time! 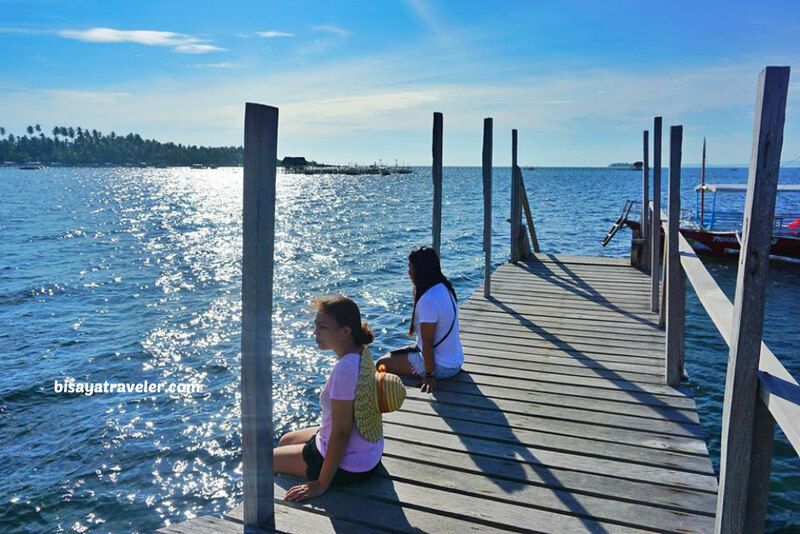 The thing is, we’d be late for our flight back to Cebu from Butuan airport if we dived into its tempting waters. Not only was time not on our side, but I also ran out of underwear and clothes. Yikes! 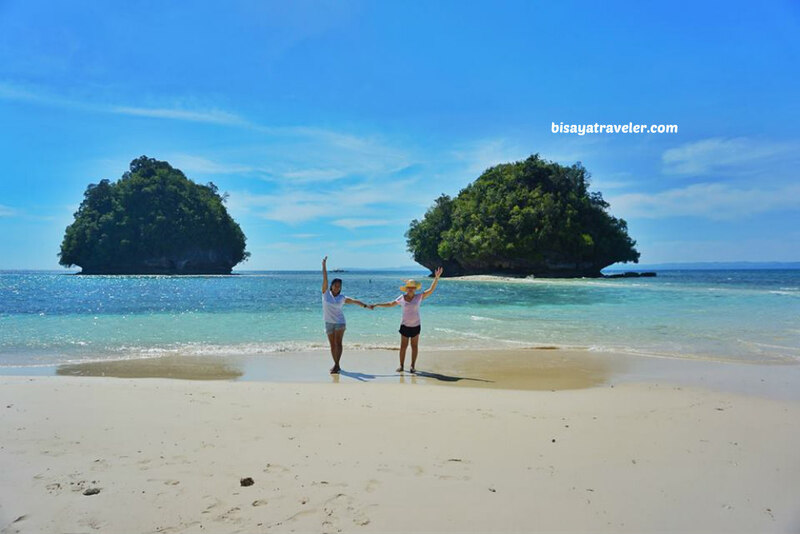 Still, we had a fantastic and memorable experience on Britania Islands. 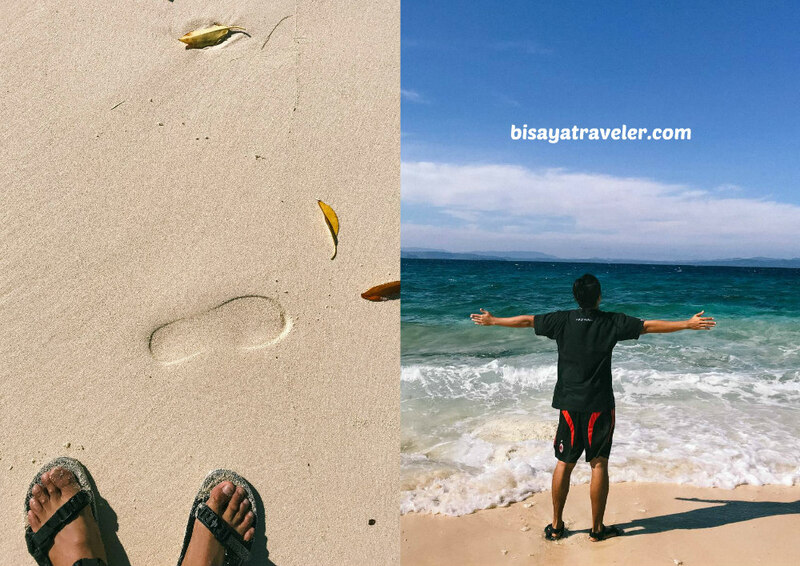 From its cerulean waters to its Tadag city’s surrounding mountains, our Britania Islands tour was absolutely filled with Instagram-worthy sights. Weary and sleepy, I dragged my body out of the bed, as soon as the alarm sounded. It was still 5:30 in the morning, and we were a little sore from our Surigao del Sur adventure, the previous day. Plus, I didn’t get a lot of sleep, a week prior to our trip, thanks to my seemingly endless workload. Eventually, though, we felt so much better and active, after indulging on a healthy and tasty breakfast courtesy Tiya Insik. With breakfast over, Rabbie, Diane and I made some preparations for our Britania Islands tour in Tandag City, Surigao del Sur. 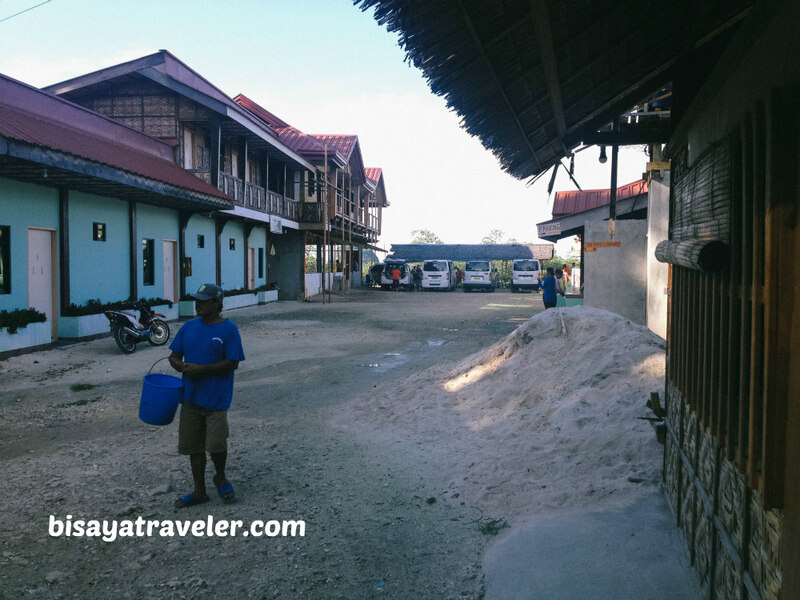 And, from Tiya Insik’s house, we took a short stroll to the main road, and hopped on a tricycle bound for the base of our tour. Along the way, we were enthralled by the bucolic charm and visually appealing landscapes of San Agustin, Tandag, Surigao del Sur. Man, I wish Cebu was as serene as this place! Moments later, we arrived at our base – Vila Rosalina Beach Resort and Restaurant. 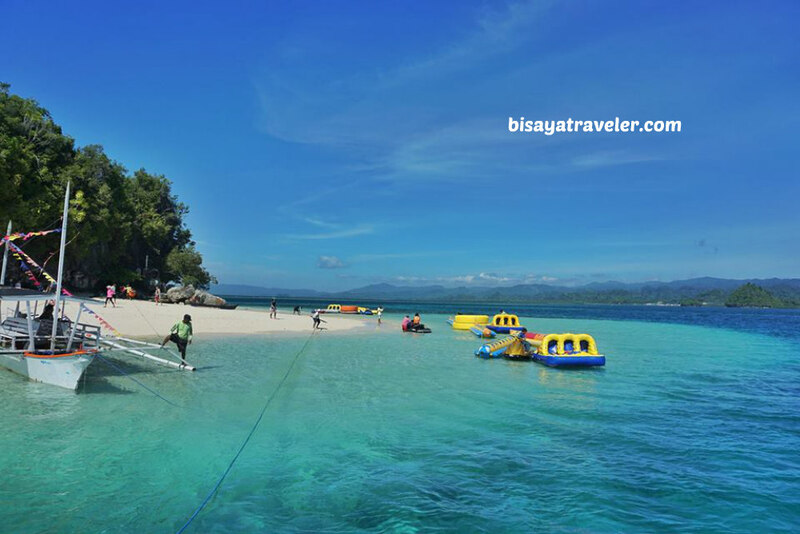 Since we were traveling with a local, we got discounts on our Britania group of Islands tour. What’s more, the entrance fees – PHP 20 per person – were waived off because Tiya Insik is from San Agustin. As we were waiting for our boat to dock, we spent some time snapping pictures of the resort’s eye-catching boardwalk. Shades of the Boardwalk on Cloud 9 Surf Resort! 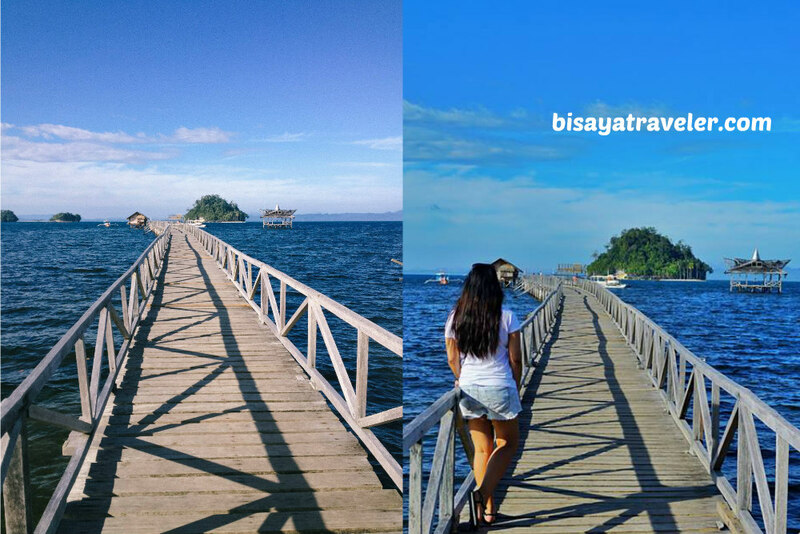 And, yes, it does look rather similar to Siargao Island’s famed boardwalk. As we were taking pictures of the boardwalk, I couldn’t help but notice how clean the water was. It was truly tempting and tantalizing. Should I give into the temptation? As always, I kept debating with myself, whether to take a plunge or just snap photos on the beach. Soon, we boarded an extremely large boat that we thought was the one for us. Truthfully, we were a bit skeptical, while we were boarding this boat. Why would the operator use a super spacious boat (capacity of 40 people) for just 4 passengers? As turns it out, it was meant for a group of teachers who were also touring Britania Islands that morning. Eventually, the right boat arrived at the docking station. 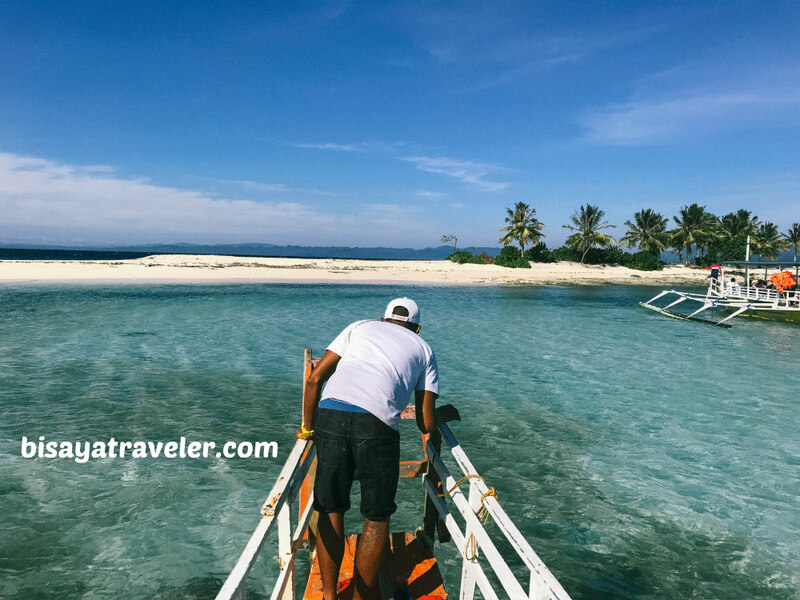 Without wasting any more time, we hopped on the boat, and went for an exciting ride to our first stop – Hagonoy Island. Why exciting? Because it was rather bumpy! And, I loved every minute of our boat ride. 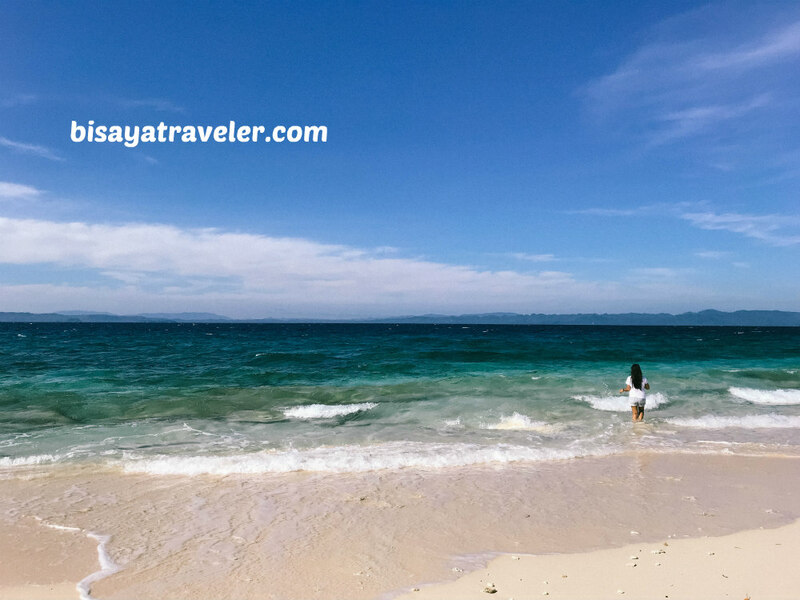 With its lush islands and alluring clean waters, it was truly a scenic experience. Honestly, that Britania Islands tour is, hands down, one of the most beautiful island hopping tours I’ve had in the last couple of years. I’d probably rank it second to Coron. As we got closer to our first stop, I just couldn’t hide my excitement. My heart was, in fact, beating faster than usual. From afar, it looked like a small slice of paradise on earth. With its spellbinding blue hues and pristine sands, the view was simply magical. 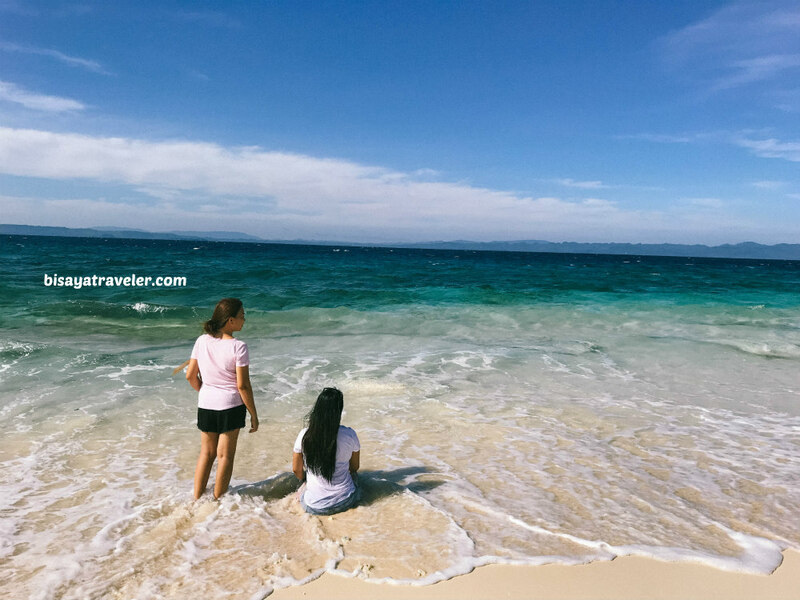 As an added bonus, the sea breeze was so relaxing and refreshing, adding more richness to the experience and appeal to our island hopping tour. 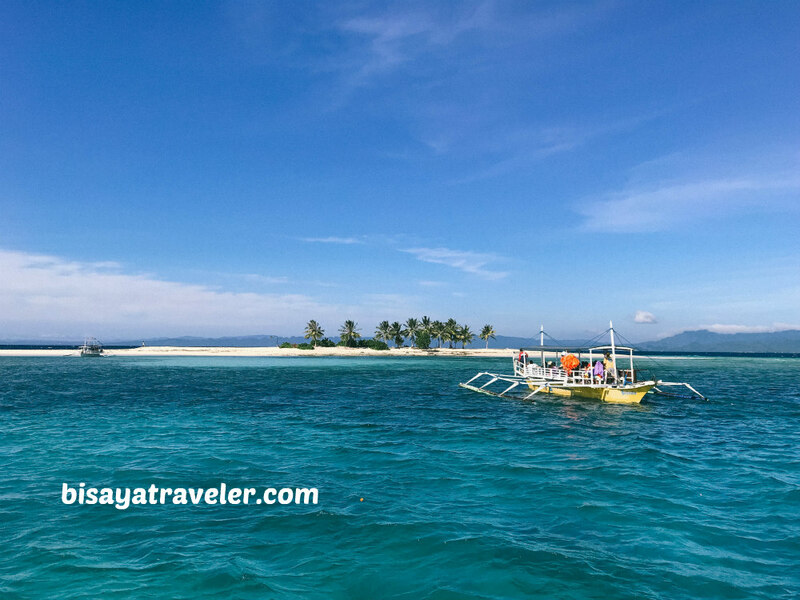 Upon our arrival, we instantly jumped off the boat, and admired the spectacular scenery of Hagonoy Island. The soft white sands, the perfect sunny weather and crystal clear waters – it was indeed a beach lover’s dream. Diane, Tiya Insik and Mrs. Bisaya Traveler were all busy posing pictures on the island. I, meanwhile, gazed on the awe-inspiring waters and pristine white sands of Britania Islands, trying to figure out if swimming is a good idea. I really couldn’t get the idea of swimming on Britania Islands off my head. It was so seductive and bewitching. 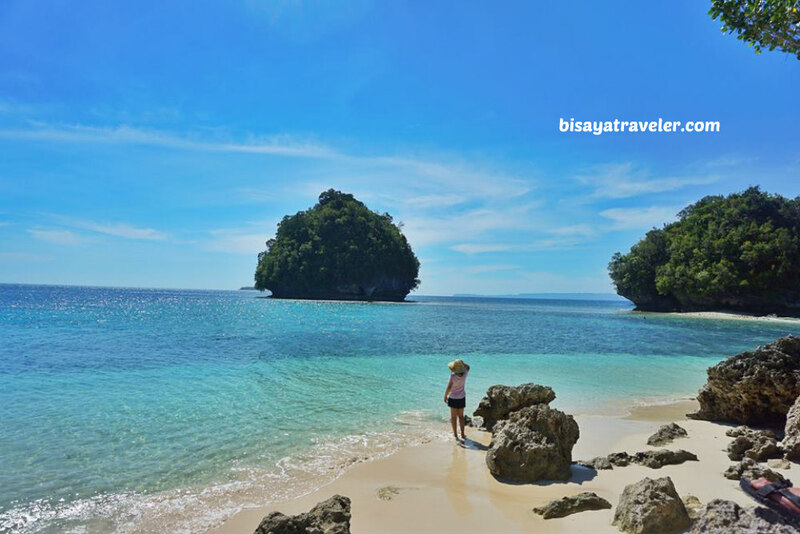 If only had an extra day in Surigao del Sur, I’d spend hours beaching like a boss on Britania Islands. 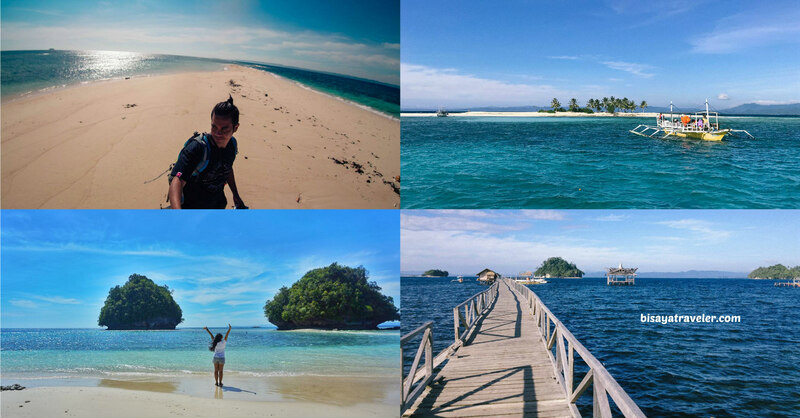 Even if I’m not a great swimmer, I won’t mind getting wet on this island in Surigao del Sur. Should I take a dip even for just a minute? Damn it – I should have brought a few more clothes and extra underwear. In the end, logic and my inner voice prevailed. We could’ve used our wet clothes, and enjoyed the gorgeous waters. But, let’s face it – swimming is a relaxing activity that may make us forget time. Heck, I almost missed a flight because I had so much fun swimming. Even so, it was such a fun and exciting experience. 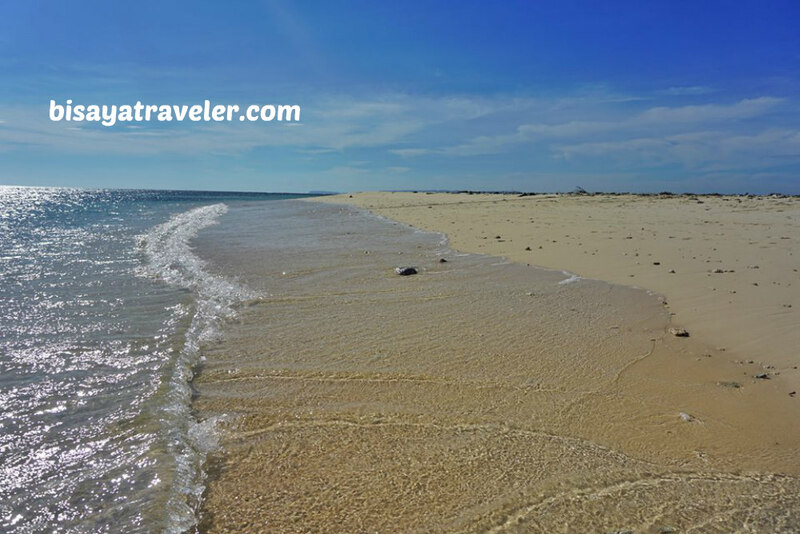 The beauty of Britania Islands is enough to make this trip worthwhile and memorable. 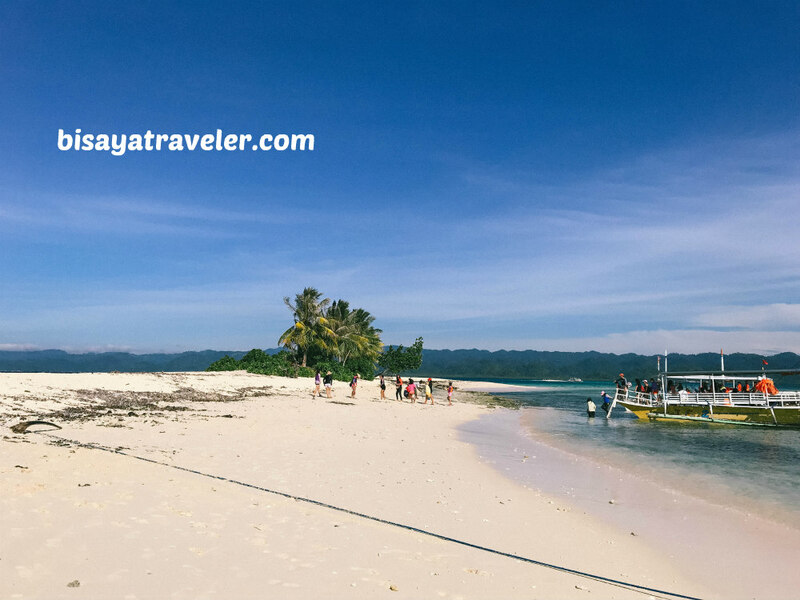 And, we did spend a lot of time on Hagonoy Island, just savoring the wonderful stress-free moments. Even though our tour was short, it was nonetheless relaxing and mind-blowing. 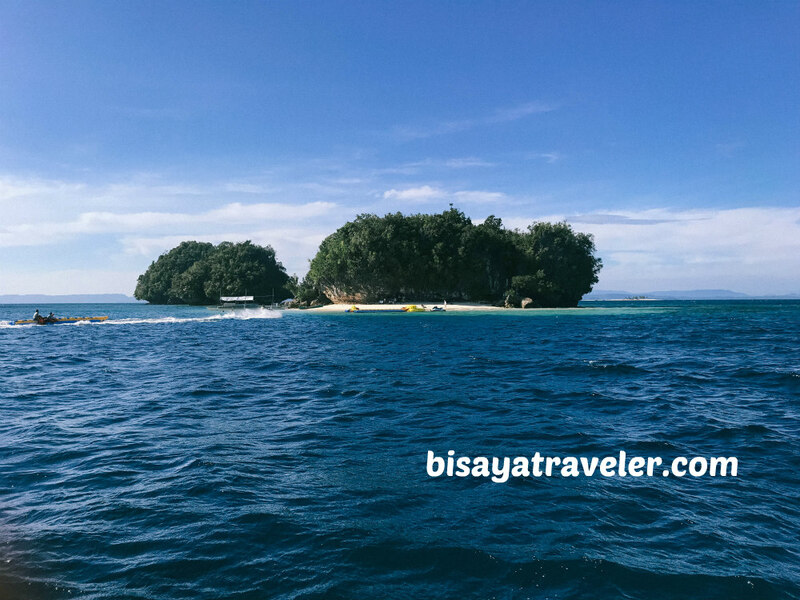 From Hagonoy Island, we went back to our boat, and made way to the next stop – The Naked Island. And, the island, as its name implies, is naked, with no coconut trees on the surface. To me, it’s more like a sandbar than an island. 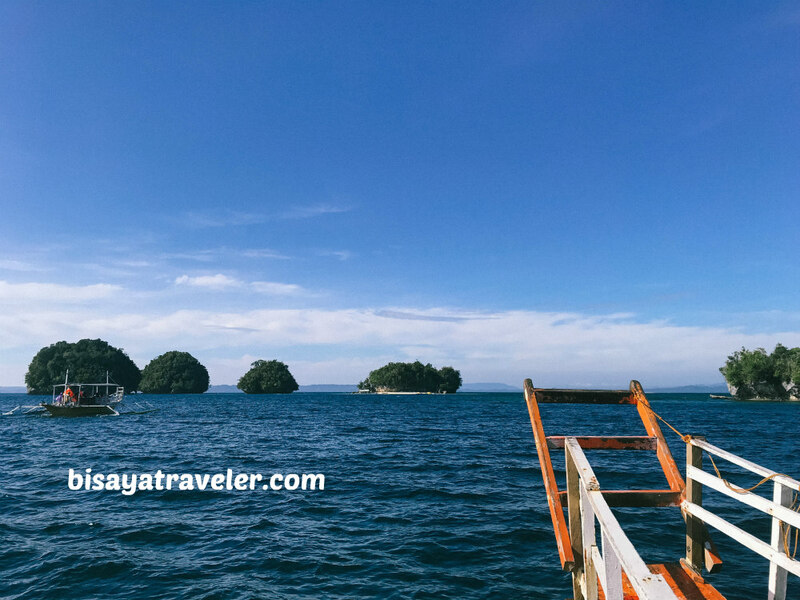 Unlike our pit stop on Hagonoy Island, we didn’t spend a ton of time on this stopover on our Britania Islands hopping tour. 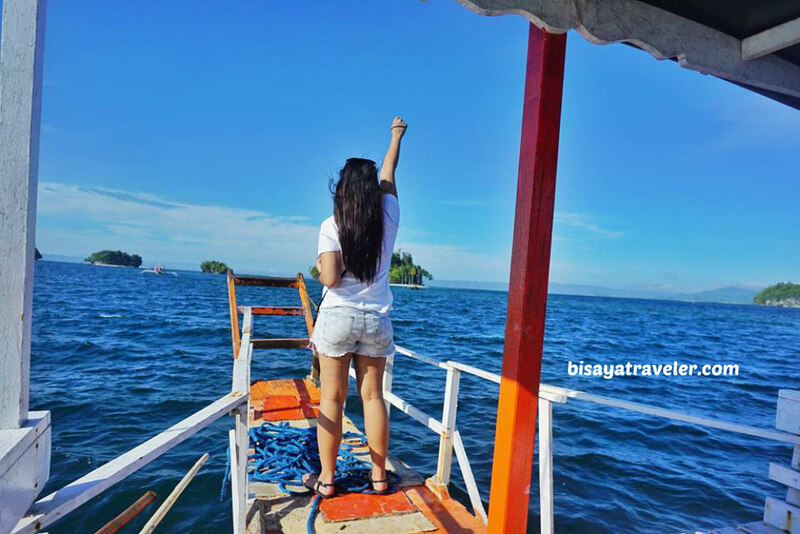 As tempting as the island and its waters were, we had to move on to our final destination – Britania Island. 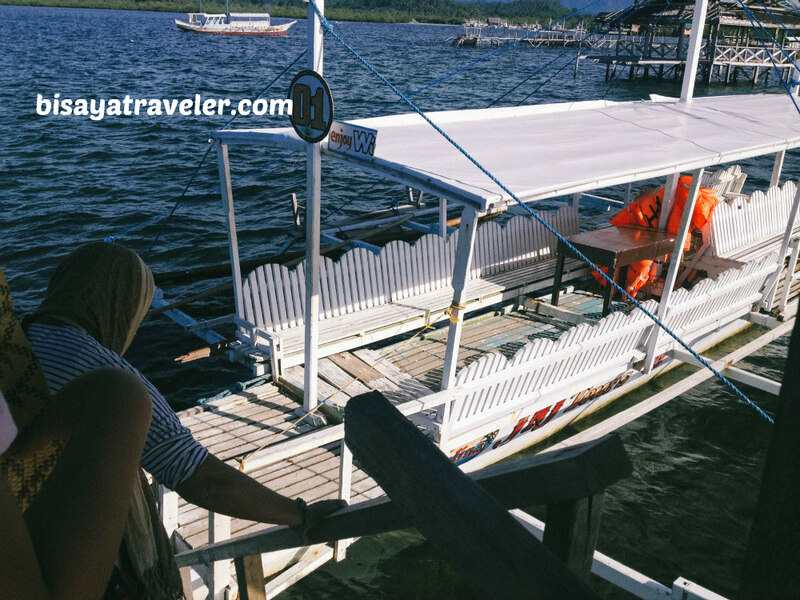 Soon after, we arrived at the island, and we were greeted by a bunch of locals offering packages for banana boat rides and jet ski adventures. Not to mention, there were vendors selling trinkets, sunglasses and a whole lot of other merchandise. 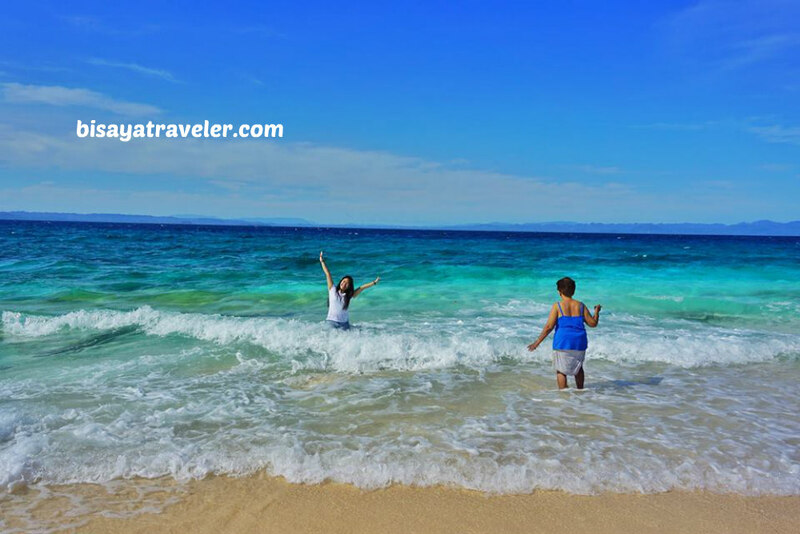 If there’s a wrinkle to this beach destination in Surigao del Sur, it’s got to be the growing commercialism. I know it’s going to a big income boost to the city and its locals, but we all know what happened to Boracay. Adding amenities and rides is cool and a nice touch to the Britania Islands hopping tour. But, they should probably take it a little slow, when it comes to adding more facilities to this island. 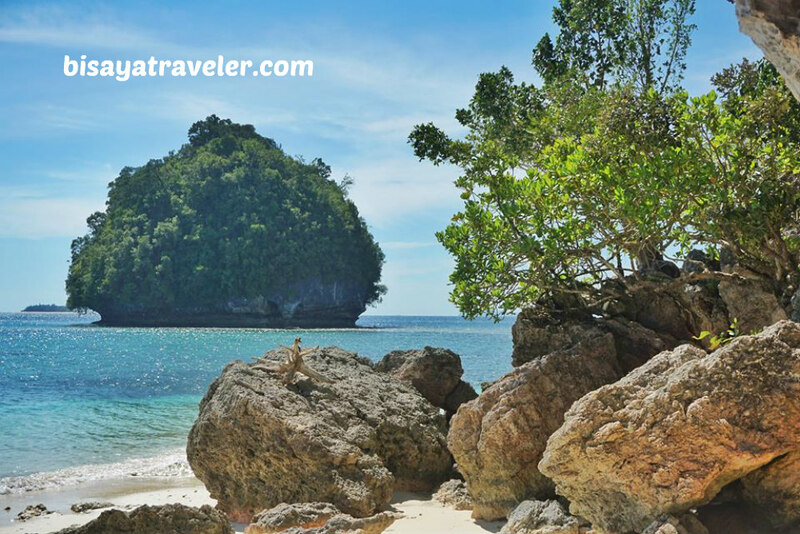 To me, the real beauty of this archipelago is its serenity and laid-back tropical charm. Hopefully, the local government will keep that in mind, as the popularity of the Britania Islands continues to skyrocket. In my opinion, it’s perfect the way it is, even with the small cluster of vendors and tour operators. We did spend some time on Britania Island, just cherishing the views and sights. 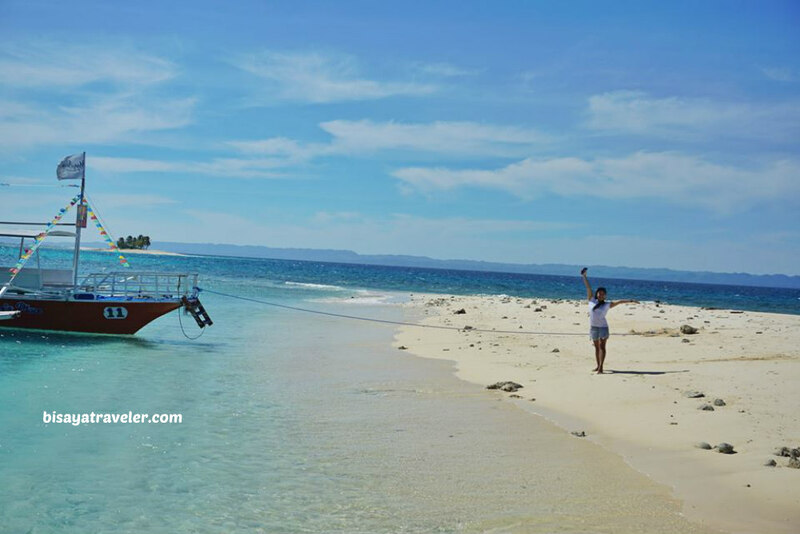 From the docking area, we went to the more secluded areas of the islands, to savor the tropical beach feel and take more pictures. And, guess what? There are dozens of Instagrammable spots on the less-crowded spots on the island, especially its cerulean waters. Once again, we were tempted to swim its dazzling and sparkling waters. But, we decided to call it off, when we found out that it was almost 10 o’clock. And so, we left the island, paid our bills, and took a ride back home. Afterwards, we bid farewell to the generous and charming people of Surigao del Sur, and traveled to Butuan. I must say it was an awesome short vacation in Surigal del Sur. See you, in the future. I promise I’ll be back! There are several ways to get to Britania Islands. For those who are traveling from Butuan, just head to Bislig via a Bachelor Express bus (travel time is 3 hours, and fare is around PHP 200 to 250). Make sure to hop on a bus with a Mangagoy (the city’s commercial center) signboard. Ask the conductor to drop you off at Barobo bus terminal or San Franz bus terminal. Afterwards, take a bus, van or keep to Tandag, and ask to be dropped off at Salvacion, San Agustin (traveling time is 1 hour only). Once there, charter a habal-habal that will take you to the resort where you can hire a boat to tour Britania Islands. If, however, you’re looking for a more convenient way to get there, contact Tickets to Ride for van rental and tour services. Besides offering island hopping tours, the resort also serves food and offers cushy accommodations. With time not on our side, we didn’t get to swim and fully enjoy the wondrous waters of Britania Islands. But, like any optimist, I think there were plenty of upsides and positives to our island hopping escapade. For one, the sights were genuinely stunning and scenic. There was literally something worth a snap at every turn. And best of all, I have another reason to visit Surigao del Sur again.